Below are trail riding saddles that are popular choices for short backed horses. If a saddle is too long for a horse’s conformation they can feel discomfort when being ridden, or may experience interference with the haunches and the saddle skirt. Therefore, many riders feel a short backed horse (also called a “short coupled” horse) benefits from a saddle that is shorter in length and/or has a round saddle skirt. For more information about short backed horses, please scroll down beneath the saddles for sale. 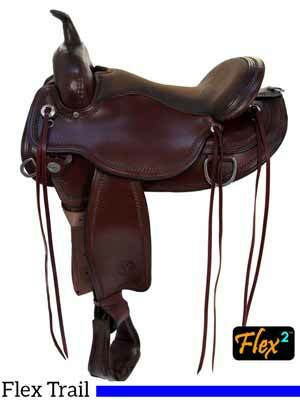 Below: The Circle Y Omaha Flex2 Trail Riding Saddle from HorseSaddleShop. This saddle is a popular choice among trail riders, including those with short backed horses. It has a round, 26″ length skirt. Below is a table of saddles to help you find your best trail saddle for a horse with a short back. These saddle are either shorter in length than what is commonly found in other saddles, have round saddle skirts, or both. Abetta Brushpopper 18 4.5" regular tree, 5.5" wide tree Square 15" seat - 24.5"
Circle Y Walnut Grove 26 5" Round 14" seat - 24"
Fabtron Cross Trail 22 5" Round 24"
Tucker Big Bend 29 4.5" Full or Round 26"
Tucker Cheyenne Frontier 28 3.5" Full or Round 25"
Tucker High Plains 26 5.5" Full or Round 24"
What Is A Short Backed Horse? A short backed (or “short coupled”) horse is a horse whose back is relatively short compared to the rest of its conformation. There is a rule of thumb that says when a horse is viewed from the side the length of the shoulder, back, and hip should all be equal. Put another way, the length of the back should be 1/3 of the horse’s overall body length (excluding the neck). A horse whose back is shorter than this is usually considered to be a short backed horse. Short backed horses are not uncommon. If you’re shopping for a saddle this is good news, because without too much trouble you can often find just the right saddle for both you and your compact equine partner. There are some things to keep in mind, though. Here are a couple. A Round Saddle Skirt May Do The Trick – For some horses, all that’s needed to accommodate their shorter back is a round saddle skirt. For these horses the round skirt will eliminate the back of the saddle from extending too far down the horse’s back, and from interfering with the hip. Look for trail riding saddles with round skirts in the table above. Beyond The Round Saddle Skirt – For some horses, a round saddle skirt won’t be enough. For those horses, pay attention to the length of the saddle. How short should you go? It depends on the horse. For example, a 16 hand horse with a short back can (most likely) comfortably wear a longer saddle than a 14 hand horse with a short back. “Short” is relative to the rest of the horse. Look for trail riding saddles with shorter skirts in the table above.